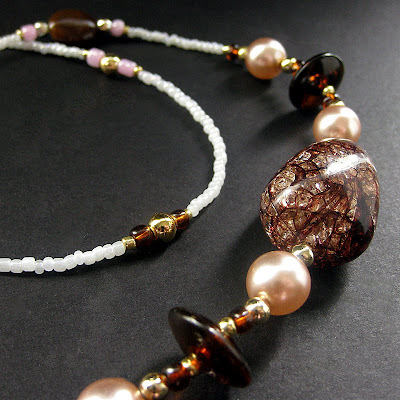 A handmade badge lanyard made from striated brown crystal-like beads and soft pink pearl beads and rich brown accents on a fully beaded strand of seed beads. Completed with a matching 1cm split-ring to securely hold a badge or keys, the nape of this strand is created to be comfortable against the back of the neck with decorative beads further down along the strand so they are shown off to their best advantage. This piece is made with a sturdy no-clasp design for added security.